Raise the bar recruiting is a unique opportunity that bridges the gap between artists and recruiter professionals at various studios. The “recruiters” that come to CTN range from specific recruiters at top studios to executive producers at start-up companies. Each recruiter that participates in Raise the Bar Recruiting is interested in either filling active open opportunities at their respective companies or updating their talent databases. This program is a high quality pre-selection process that is designed for artists of all skill levels to be considered for future work throughout the film/vfx/animation/game industry. 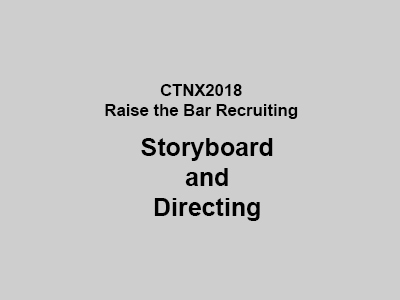 Recruiters review portfolios online before the show and select who they would like to interview, and the team at CTNx will set up a meeting time convenient for both parties during the three-day eXpo. All applicants are notified one way or other about their status. INTRO AND ELIGIBILITY: Raise the Bar recruiting is open to artists who have a 3-Day Floor Plus, 3-Day Passport, 3-day VIP Passport, Table, Premiere Table, Booth, Premiere Booth pass to the CTN animation eXpo. This is an opportunity to potentially interview for a job in the film/vfx/animation/game industry. HOW TO ENTER: Register as an artist by clicking on "Artist Registration" above and start uploading your portfolio/reel as soon as your account has been approved. Choose an array of artwork (12 pieces) that best represents your current skill (as if you are applying to a job). The first day to submit a porfolio is October 1st, 2018 (you must have one of the passes above to participate) and the last day to submit a portfolio is October 28th, 2018 11:59PM PST for the eXpo this year happening throughout the weekend of November 16-18, 2018. Artist Portfolio Upload Opens October 1st, 2018 (you must have one of the passes above to participate). Artist Portfolio Upload Closes October 28th, 2018 11:59PM PST. If you are chosen for an interview you will receive an email from the CTN team on the time and date of your meeting place. You do not need to rush to apply on the first day. This does not work on a "first-come-first-serve" basis. Please note that you must create a new login/account for CTN Recruiting. This is separate from your Event Registration account.